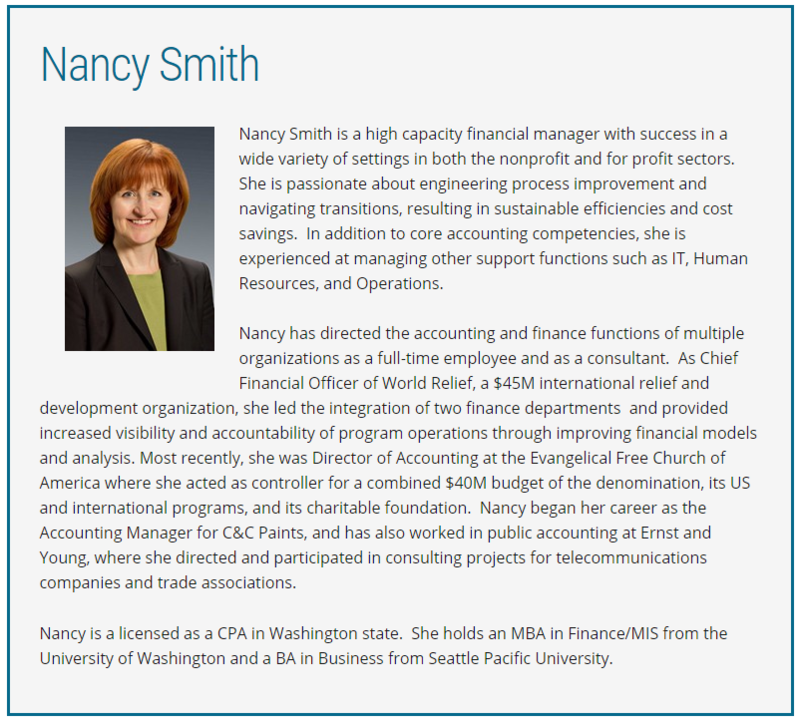 Nancy Smith is a high capacity financial manager with success in a wide variety of settings in both the nonprofit and for profit sectors. She is passionate about engineering process improvement and navigating transitions, resulting in sustainable efficiencies and cost savings. In addition to core accounting competencies, she is experienced at managing other support functions such as IT, Human Resources, and Operations. Nancy has directed the accounting and finance functions of multiple organizations as a full-time employee and as a consultant. As Chief Financial Officer of World Relief, a $45M international relief and development organization, she led the integration of two finance departments and provided increased visibility and accountability of program operations through improving financial models and analysis. Most recently, she was Director of Accounting at the Evangelical Free Church of America where she acted as controller for a combined $40M budget of the denomination, its US and international programs, and its charitable foundation. 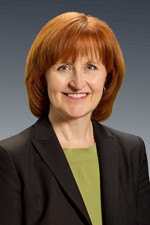 Nancy began her career as the Accounting Manager for C&C Paints, and has also worked in public accounting at Ernst and Young, where she directed and participated in consulting projects for telecommunications companies and trade associations. Nancy is a licensed as a CPA in Washington state. She holds an MBA in Finance/MIS from the University of Washington and a BA in Business from Seattle Pacific University.